Everhard’s Precise-temperature heater uses an internal precision thermostat for highly accurate temperature control. The heater has a thermostat control screw behind a rear tamper-proof cover plate, accessible only by using a special tool bit (included). The operating temperature can be monitored with any digital Type K-compatible thermometer (not included). The heater compartment features a closed back to decrease temperature variation, and a spring steel hold-down to ensure that the tool stays in direct contact with the heater element. Precise temperature control thermostat maintains required set point within +/-10 – 15°F. 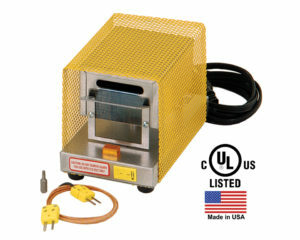 Maximum heater temperature is 750°F. Tamper-proof cover plate over thermostat control prevents unwanted changes in desired temperature for heater. Supervisor can verify heater core temperature using a Type K-compatible thermometer. Closed back minimizes air movement within heater element, which provides a more consistent temperature. Spring hold-down clip holds knife securely in place and provides direct contact to heater element allowing faster heat transfer. Perforated steel guard is a safety feature that protects users from coming in contact with heater. Everhard can pre-set the heater temperature to your specifications.